Most people are aware that YouTube is the leading video sharing giant on the web today, but that doesn’t necessarily mean that it has everything. In fact, a lot of people prefer another popular video sharing service over YouTube, called Vimeo. It differs largely from YouTube because of its “artsy” distinctiveness. That’s not to say that there aren’t any great artists promoting their work on YouTube – because they’re definitely there as well – but YouTube is so huge that it encompasses everything you could point a camera at. Vimeo, on the other hand, is very much known specifically for creative artistry. However, when you are trying to upload Blu-ray to Vimeo, you may get into trouble since Vimeo website doesn’t support Blu-ray uploading. According to Vimeo Help Center, H.264 video with AAC audio in MOV or MP4 format is preferred format for Vimeo uploading. To share Blu-ray on Vimeo, you will need to rip Blu-ray movies to Vimeo friendly H.264 MP4 or MOV first. With the assistance of UFUSoft Blu ray Toolkit, all becomes easy. It can serve as a professional Blu-ray to Vimeo converter that lets you get videos with optimized settings for uploading to Vimeo. 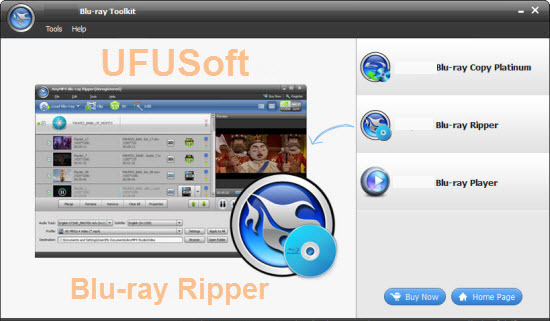 Besides, it can also convert Blu-ray to video formats like AVI, WMV, FLV, ASF, M4V, MKV, etc. and extract audio from Blu-ray to format preferred by most online websites like Facebook, YouTube, Break, Metacafe, Dailymotion, Hightai, etc. for sharing anywhere. Better still, you can edit Blu-ray video by cropping, trimming, adjusting effects and cutting your long video clips to a shorter ones, all becoming easy with this Blu-ray to Vimeo ripping program. If you are using a Mac, you can use the equivalent Blu-ray Ripper for Mac to help you upload Blu-ray movies to Vimeo on Mac OS X. How to Convert Blu-ray to Vimeo, Rip Blu-ray Video to Vimeo? Insert the Blu-ray disc into your computer’s Blu-ray drive and run Blu-ray Ripper. You can click the “Load Blu-ray” button to load the Blu-ray files to the program. Blu-ray ISO/IFO, VIDEO_TS folder are supported also. As has been stated above, Vimeo supports MP4, etc video files. So you can just select “Common Video” > “H.264 Video(*.mp4)” as the output video format. Since Vimeo has limitations about the uploading video size and length, please pay attention to the video size when ripping Blu-ray movies for Vimeo. Here we should highlight the trim function on this software. Just click “Edit” to trim the Blu-ray videos to get the very part you want. Besides trimming, cropping, adding watermark, adjusting special effect, are well supported as well. When all these settings are ready, you can click the “Convert” button to begin the Blu-ray to Vimeo conversion. When the ripping is done, you can click on “Open” button to locate the ripped videos. Although the 500MB storage limit and 720p HD video are more than enough for most Vimeo users, the site offers an upgrade with even more features and space. If you shot your video in full HD, or 1920 x 1080, there’s a good chance that you want to play it back online that way, too. Vimeo offers two different upgrades – Plus and PRO – that feature advanced options for showcasing your video at its best. Vimeo Plus features 5GB per week of video storage, which is large enough to upload virtually any short video or clip in HD. This storage limit restarts every week so you can upload a new project or clip every 7 days if you run out of space. With a free Vimeo account you can upload 1 HD video per week, but the Plus upgrade lets you upload unlimited HD video as well as allowing for HD embedding on other websites and blogs. This makes Vimeo Plus a great option for hosting video for your portfolio, project, or personal website. The Vimeo Plus upgrade is one of the most affordable video hosting options you’ll find online. If you’re a creative professional and need even more storage capacity for your endeavors, Vimeo also offers the PRO upgrade which features 50GB or storage, unlimited video plays, and HD 1080p video. Perhaps the most important part of the PRO upgrade is that it lets you add your own brand to your videos and site, and removes the Vimeo logo. In addition to having full creative control of your site, you’ll also enjoy advanced controls for video playback and the video player itself.